Rooms 48 (3 suites, 2 with separate bath & shower, 1with shower only, all no smoking). B&B from about €110 pps, ss €40. Lift. 24 hr room service. Free broadband wifi. Short/special interest/off season breaks offered - details on application. Owenmore Restaurant open daily, D 6.30-9 (Set D €65), house wines from about €30. Fisherman’s Pub food all day, 12.30–9pm daily. No service charge. Open for Christmas. Amex, Diners, MasterCard, Visa. 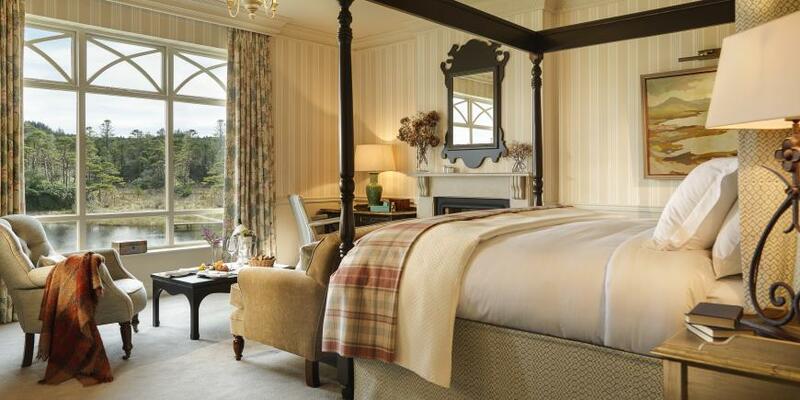 Renowned as a fishing hotel, this wonderful place was the Guide's Hotel of the Year in 2012. A crenellated Victorian mansion, it enjoys a most romantic position in 450 acres of ancient woodland and gardens on the banks of the Ballynahinch River. Its scale is impressive and, in the excellent care of hands-on General Manager Patrick O'Flaherty and his outstanding staff, the atmosphere is relaxed - a magic combination, which, together with a high level of comfort and friendliness (and an invigorating mixture of residents and locals in the bar at night), combine to bring people back. The tone is set in the foyer, with its huge stone fireplace and ever-burning log fire - a cosy place to enjoy afternoon tea. The many necessary renovations and extensions through the years have been undertaken with great attention to period detail, a policy also carried through successfully in furnishing both public areas and bedrooms, many of which have lovely views over the river. A stay here is always a restorative treat - especially if you have a choice of rooms to suit your needs; some ground floor rooms overlooking the river have direct access to the gardens, for example, and - while the style is generally quite traditional - there are some on the top floor which have recently been ever-so-slightly-modernised in a lovely gentle classic style, with bathrooms to match. Rooms (and bathrooms) are very thoughtfully furnished, with everything in the right place, so even the smallest rooms are very comfortable. And, after a restful night’s sleep, an excellent Ballynahinch breakfast will give you a good start ahead of a day’s fishing, wilderness walks and other activities on the estate (the gardens should not be missed), or simply touring the area. 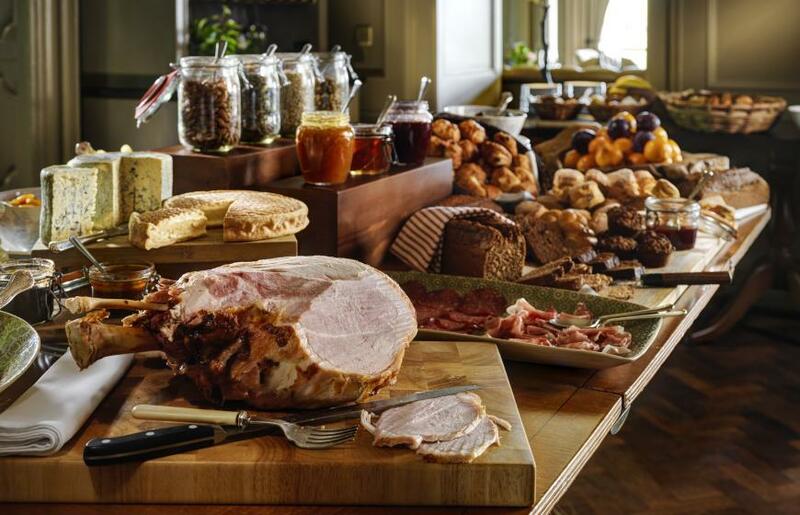 High points of the breakfast experience at Ballynahinch include the excellent breads, the homemade granola and, especially, their own rare breed pork products. 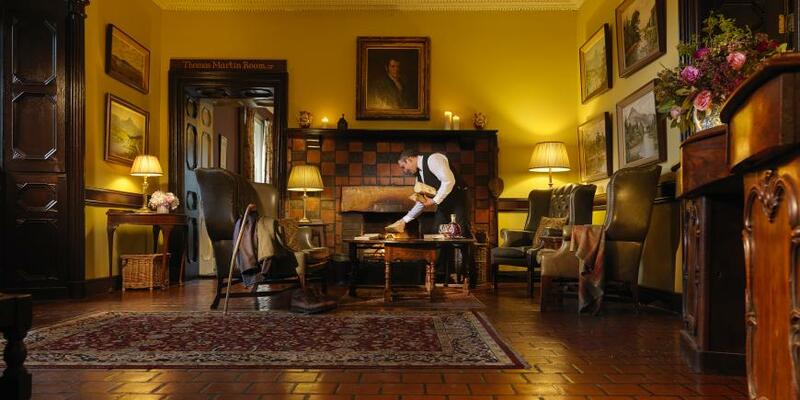 These include a baked ham that takes pride of place on the buffet each morning and the delicious bacon that features in the full Irish Breakfast and other dishes on the day's menu.The pigs are kept near the walled garden and guests are welcome to go and see them. Major structural work was (very subtly) undertaken at the Castle early in 2017, including the installation of a lift, which will make arrivals and departures (and, indeed, moving around this rambling old building) much easier and more convenient. A two to three year programme to renovate the Walled Gardens is also under way, with walls having been re-built and hard landscaping completed; replanting and productive growing for the kitchens will begin when soil improvement work has been completed. It promises to be an exciting project. Fishing: 3 miles of private fly fishing for Atlantic salmon, sea trout and brown trout. 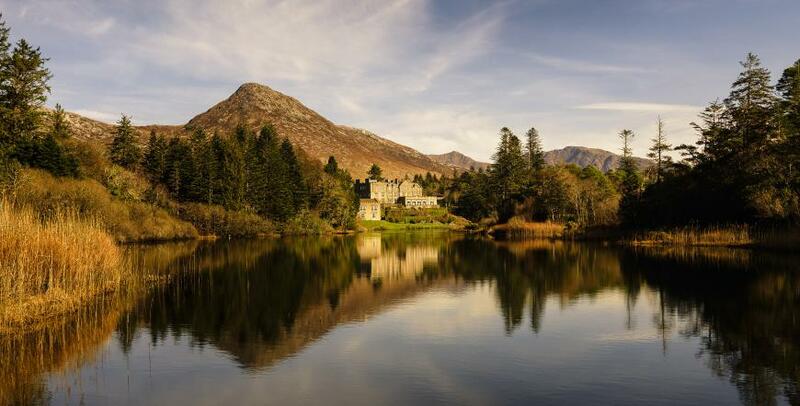 Landscaped gardens and wilderness walks on 650 acres with over 10 miles of looped walking trails (guided walks also available by arrangement); members of Connemara Garden Trail; cycling, clay shooting. Golf nearby. A half day boat trip from Roundstone pier is also available, it includes a visit to Inishlacken Island and pulling up the lobster pots. This bright and elegant room has recently undergone a gentle makeover, and is carefully organised to allow as many tables as possible to enjoy its uniquely beautiful river setting, where you can watch happy fisherfolk claiming the last of the fading daylight on the rocks below. 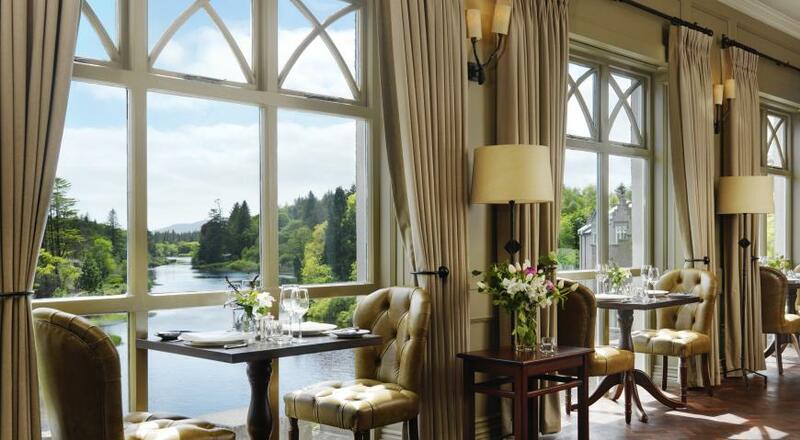 Several very successful head chefs have confirmed the reputation of Ballynahinch as a dining destination in recent years - and, late in 2016, the baton passed to Pete Durkan, who clearly relishes "bringing the larder of Connemara onto the tables of Ballynahinch Castle". The raw ingredients are superb - McGeough’s in Oughterard supply the meats and, when available, their own Ballynahinch pork, gammon and bacon is a real treat. The cooking is excellent, with just the right attention to menu choices and presentation to give a sense of occasion without in any way upstaging the quality ingredients used, or the special setting. Staff are hospitable and relaxed, and a thoughtfully assembled wine list offers an unusual range of house wines and a good choice of half bottles – and expert advice on making the best choices for your meal. 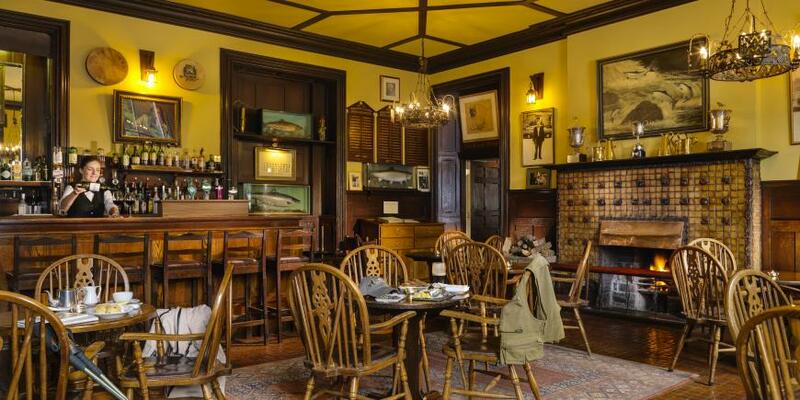 *Excellent meals are also served in the hotel’s characterful bar, the Fisherman’s Pub, a mighty high-ceilinged room with a huge fireplace and many mementos of the pleasures of rod and hunt. The original bar has recently been extended into the adjacent room, an extension that works very well due to its sympathetic furnishings - and, especially, the inclusion of another huge fireplace. An informal alternative to the Owenmore experience, the pub is known for its good food and conviviality - and it's a great place for non-residents to drop into for a bite when touring Connemara. N59 from Galway - Clifden; left after Recess (Roundstone road), 6 km.